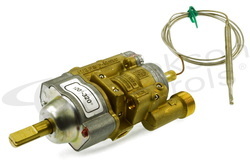 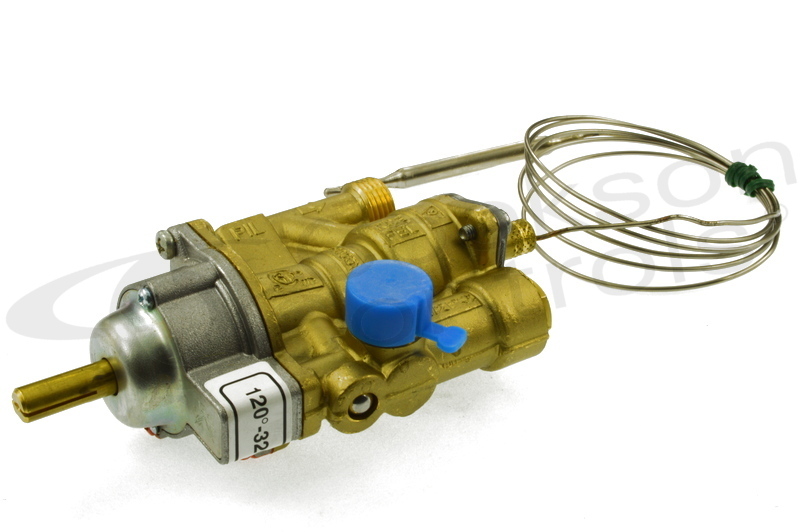 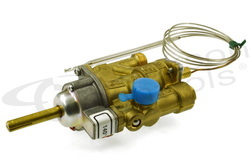 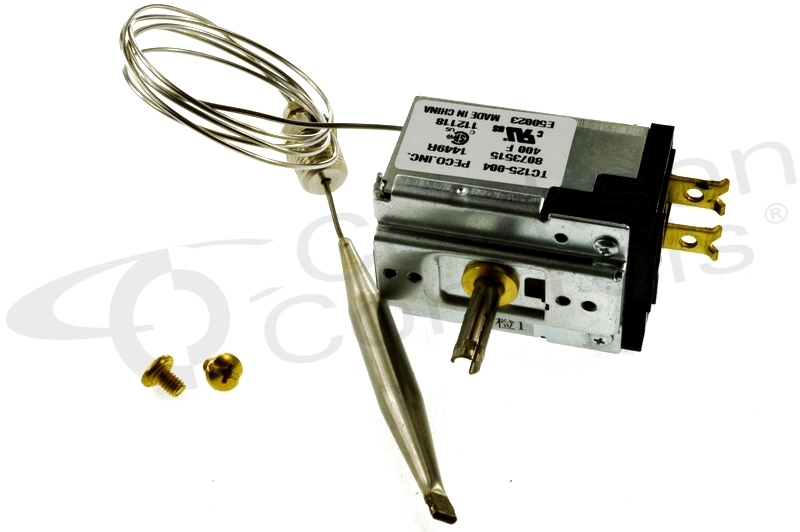 PEL 24STS gas oven thermostat, 120 to 320C, capillary length 1200mm, bulb 6 x 100mm, M9 thermocouple connection. 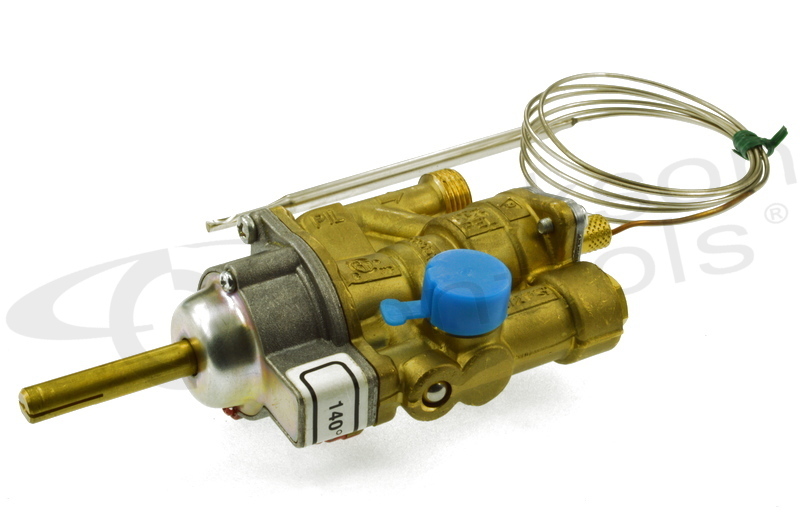 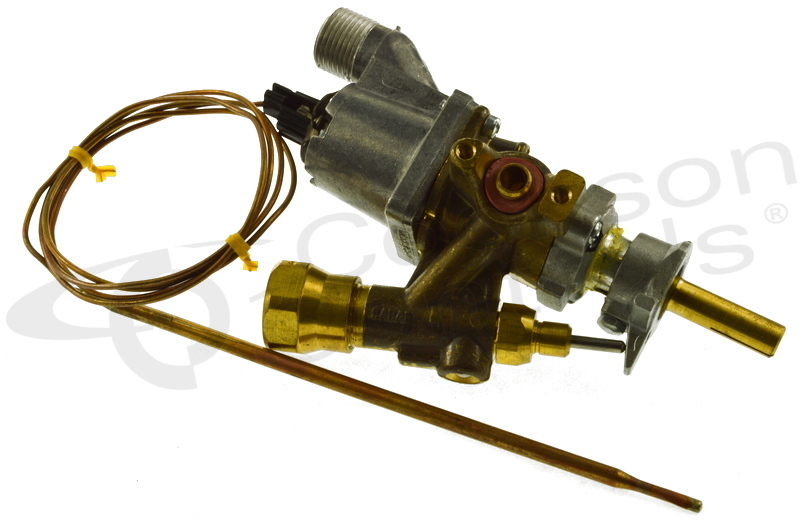 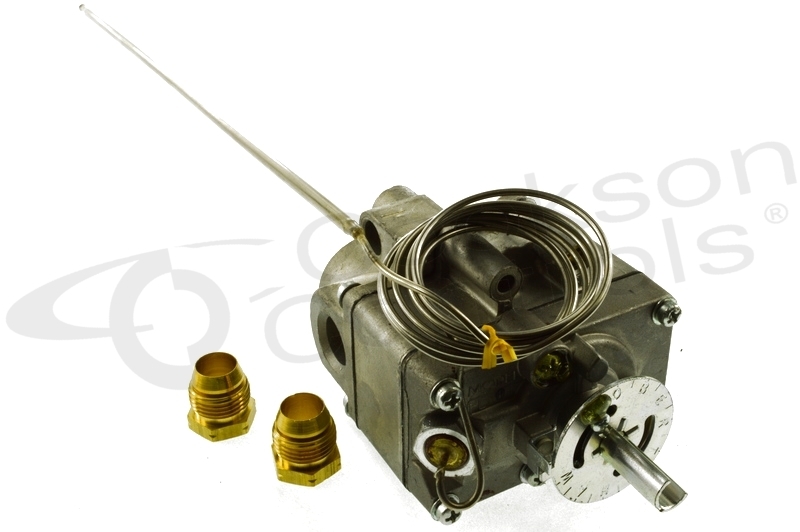 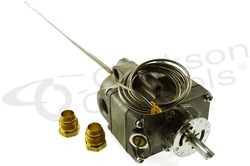 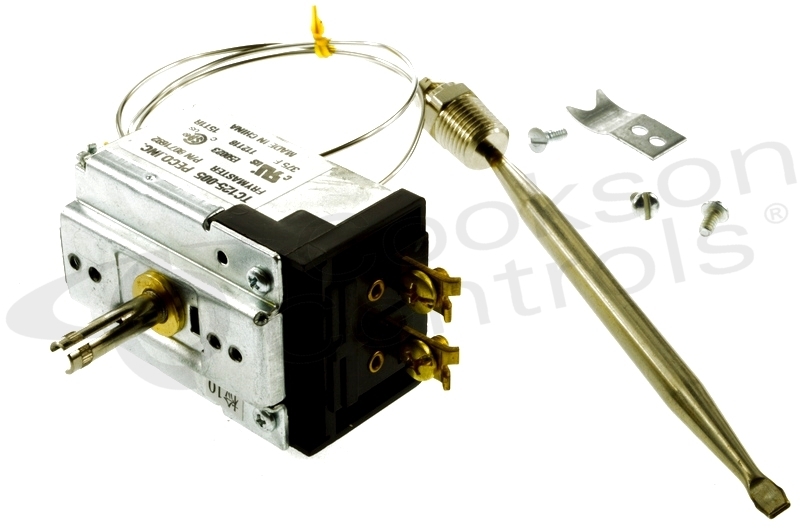 PEL 24STS gas oven thermostat, 120 to 320C, Zanussi 058369, Baron BN6A023700, capillary length 120mm, bulb 6 x 100mm, M9 thermocouple connection. 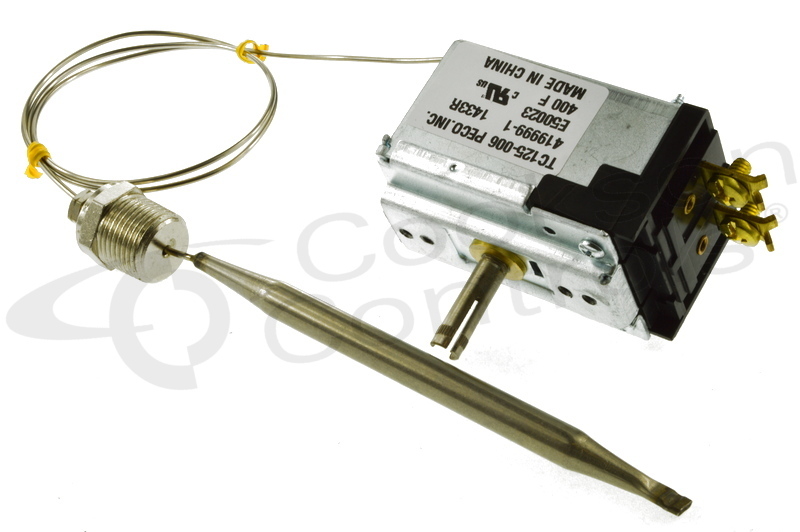 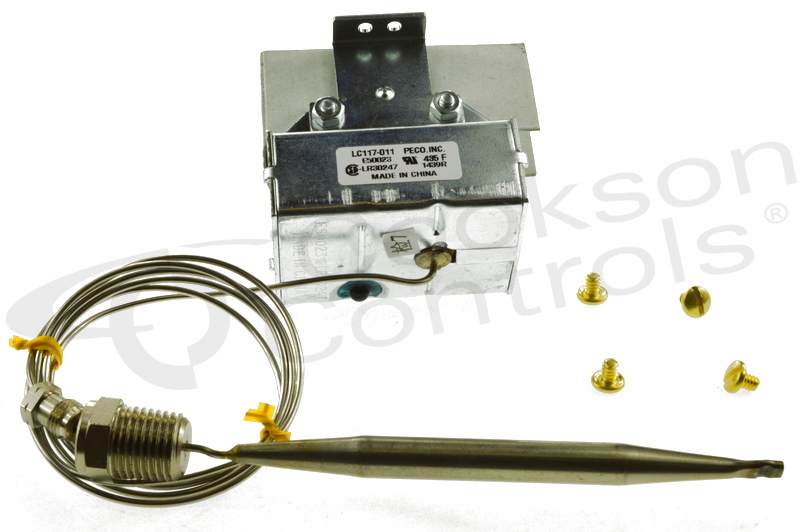 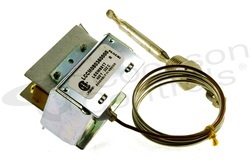 PEL 25ST gas oven thermostat, 140 to 300C, Zanussi 004257, 006597, capillary 900mm, bulb 6 x 100mm, M8 thermocouple connection. 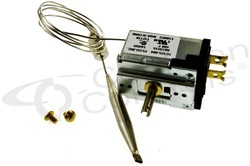 PEL 25ST gas thermostat suit bain marie, 30 to 90C, capillary length 1200mm, bulb 6 x 160mm, D shaped shaft 8-6.5mm, M9 thermocouple connection. 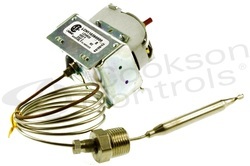 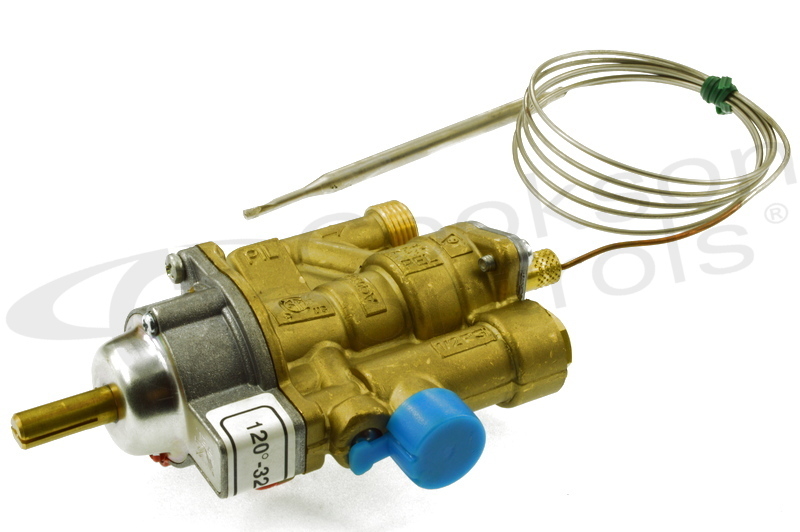 PEL 24TS gas oven thermostat, horizontal pipe connections, 120 to 320C, Angelo Po 33A0060, 6003911, capillary length 1200mm, bulb 6 x 75mm, M9 thermocouple connection. PEL 25ST gas oven thermostat, vertical pipe connections, 120 to 320C, Jemi 998130, capillary length 1200mm, bulb 6 x 100mm, M9 thermocouple connection. Robertshaw RX-1-36 gas fryer thermostat, millivolt type, 400F, capillary 1200mm, bulb 8 x 80mm, with stuffing box gland M8x1 and 3/8" tank sealing fitting, American Range part number A50400. 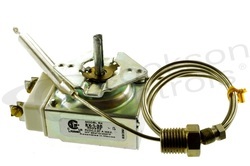 Sabaf gas oven thermostat, La Germania part umber D64C20. 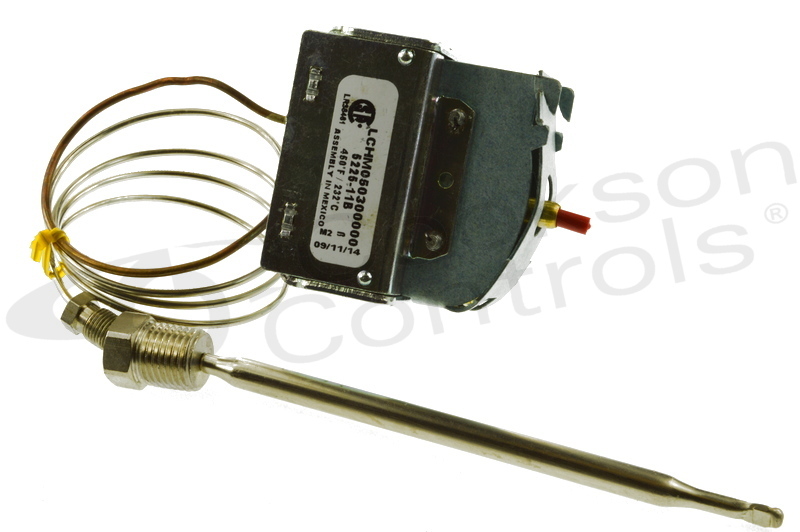 Robertshaw high limit thermostat, auto reset, 435F, capillary length 900mm, bulb 8 x 100mm, with stuffing box gland M8x1 and 1/4" tank sealing fitting, suit Dean model SR42 and Frymaster, part number 8073516. 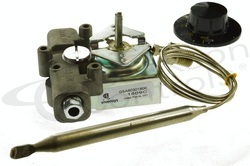 Robertshaw gas fryer o/temp thermostat 450F/232C, auto reset, capillary length 1200mm, bulb 8 x 80mm, with stuffing box gland M8x1 and 3/8" tank sealing fitting, American Range part number AMRA10007. 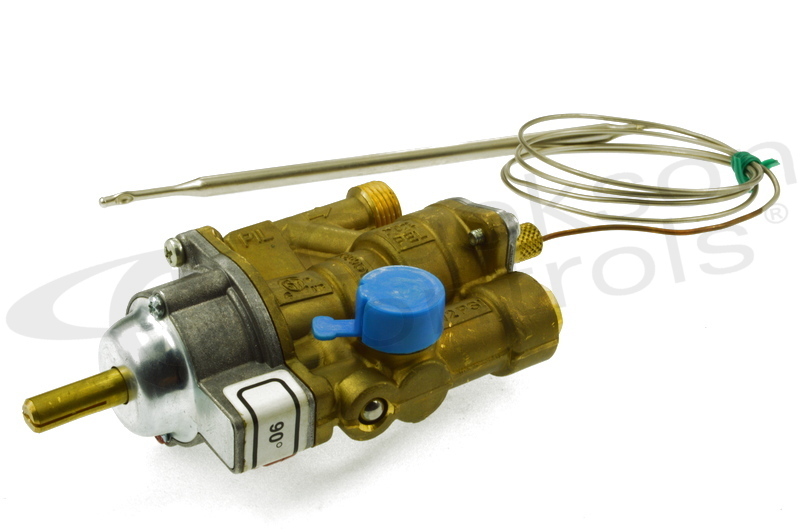 Robertshaw gas fryer o/temp thermostat 450F/232C, manual reset, capillary length 1200mm, bulb 8 x 80mm, with stuffing box gland M8x1 and 3/8" tank sealing fitting. 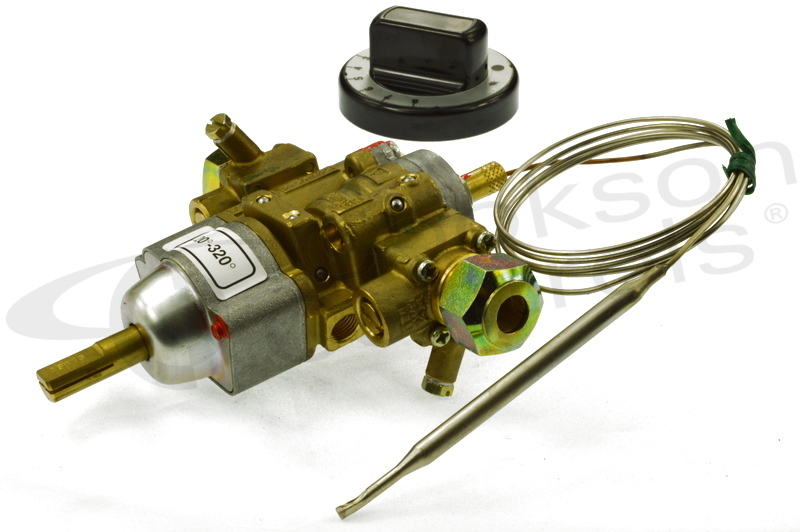 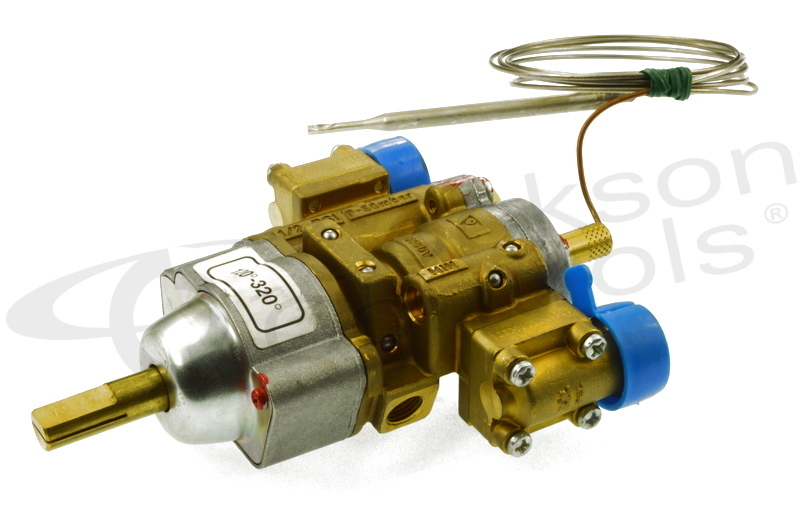 Robertshaw 1590C gas fryer thermostat with knob, 100 to 220C, capillary length 760mm, bulb 10 x 125mm, with stuffing box gland M8x1 and 1/4" tank sealing fitting, 1/4" inlet and outlet pipe fittings, Pitco part number P5047588. Robertshaw gas fryer o/temp thermostat 450F/232C, manual reset, capillary length 800mm, bulb 6 x 125mm, with stuffing box gland M8x1 and 1/4" tank sealing fitting, Pitco part number PP10084.